This Guide To Copy Backup Files From Server to DropBox Cloud, is Tested on HP Cloud & Will Work on All Servers including OpenStack Instances. There can be hundreds of problems with web content – web host issues, hacker attacks, migration, any disaster. For within the same datacenter, in case of OpenStack, OpenStack Raksha and Floating IP is the method of choice. This is file level backup. You can indeed upload the snapshot image to DropBox. We do not recommend to keep the method simple, easy to detect any security issue. If you need temporary or permanent migration, at least the website’s MySQL or any Database Backup and backup of the other files are very basic need to restore the website. You must test the backups. Darren Rowse (problogger.net) has excellent articles for tips on Backup. Web Hosts are dangerous, particularly for the Non-US residents using US servers, always use multiple ways of backing up the website. If you do not have the backup, you will only get the texts from Google Cache and Way Back Machine. Always keep the meta index for this lifeboat. We can not buy the servers, we are tenants on rent. DropBox Cloud Storage has a basic advantage – it has a free usage tier. You always need a free usage tier if you are living outside of US. If your payment method fails, that free cloud storage which you never cared will appear as Angel. To restive the files, rather to restore, you can use the “Share Link” of DropBox to retrieve the direct link to the file using wget. Do not forget the password! Try to make separate small directories & keep the size of the zips smaller. Do not use too much complicated password, if keyboard mapping disturbs, you’ll get in to solid trouble to restore. 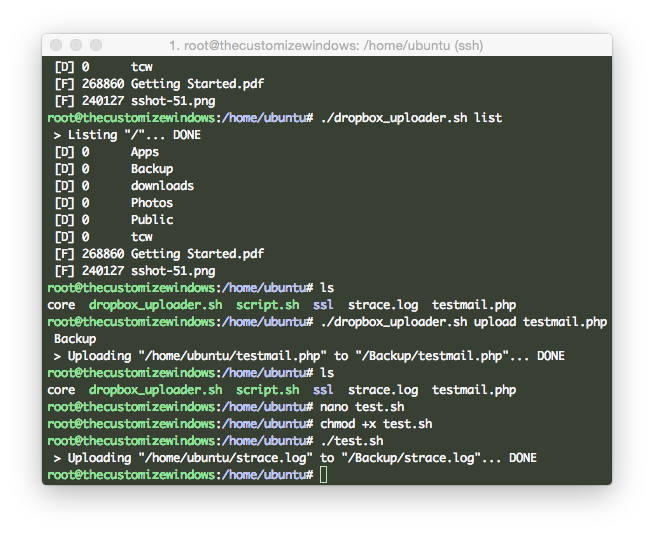 The script supports a download option as command, apart from wget. Definitely you have DropBox Cloud Storage Account with sufficient storage. We have 18.25 GB by referrals earnings from our website guides’ links to register for DropBox. It is enough to have a bigger website’s backup fully free of cost. Let us start. Open that webpage on Browser, select Dropbox API app as option and proceed. In very short, the App need to be fully permissive. Options changes when Dropbox upgrades their API, at the time of publication of this guide, you need to select – “No ” My app needs access to files already on Dropbox.” and “All file types ” My app needs access to a user’s full Dropbox.” options and create the App. You are the only user, there will be one App key and one App secret, you need only these two things for completion of the steps on SSH. chmod it to become executable by running chmod +x upload.sh command. then the script will run every 5 minutes even if you log out from SSH. We have created a Github repo here for you, so that, you do not need to copy-paste. This Article Has Been Shared 2912 Times! Cite this article as: Abhishek Ghosh, "Copy Backup Files From Server to DropBox Cloud (HP Cloud)," in The Customize Windows, August 27, 2015, April 23, 2019, https://thecustomizewindows.com/2015/08/copy-backup-files-from-server-to-dropbox-cloud-hp-cloud/.